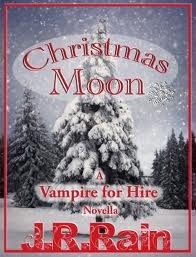 Blurb: Mother, wife, private investigator...vampire. Seven years ago, federal agent Samantha Moon was the perfect wife and mother, your typical soccer mom with the minivan and suburban home. Then the unthinkable happens, an attack that changes her life forever. And forever is a very long time for a vampire. Now with Christmas just around the corner, Samantha Moon finds herself taking on a very strange case. A mysterious family treasure has been stolen, something priceless that's been passed down through the generations, something buried in secrets. Samantha's reward is simple: she gets half of whatever it is...if she can find it first. This is just a novella, so it isn't really long, but it was really good! Although it has a main storyline that is solved in it, most of the novella just raises questions that I hope are answered in book Five. There are just so many different things going on in it and most of those are leading to the next book. I just don't know what to think about it exactly, even though it was good, I just have way to may questions about what happens next lol. If you're a fan of the Samantha Moon series I seriously recommend reading it before you read the next book!